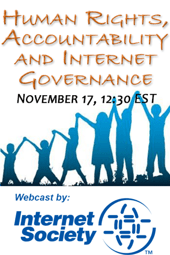 Today, Monday 17 November 2014 the Greater Washington DC Chapter of the Internet Society (ISOC-DC) and the Institute of International Economic Policy (IIEP) present Human Rights, Accountability, and Internet Governance . This free luncheon seminar considers how recent proposed changes in Internet governance will affect human rights online and how Internet governance institutions and processes might be made more accountable to netizens. Panel: Ambassador David Gross, Wiley Rein; Danielle Kehl, Open Technology Institute, New America Foundation; Manu Bhardwaj, United States Department of State; Robert Guerra, Founder & Executive Director, Privaterra; Member, ICANN Security and Stability Advisory Committee (SSAC); Andrea Glorioso, European Union Delegation to the United States. Moderator: Susan Ariel Aaronson, Research Professor of International Affairs, The George Washington University. The event will be webcast live on the Internet Society Livestream channel.